I have found at times New Super-Man has a tendency to lag, and often the book gets too banterful for its own good. But if New Super-Man Vol. 3: Equilibrium has something of a rough start (and a wholly unnecessary Suicide Squad appearance), it picks up with some time travel, meta-commentary, and familiar DC Universe guest-stars. 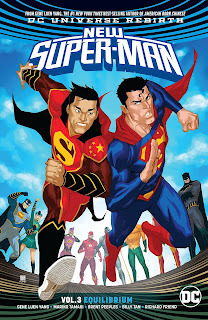 It's no secret this book becomes New Super-Man and the Justice League of China with its next volume, and indeed that's the best part of this book, that the annoying characters with which this book started out have actually coalesced into an enjoyable team with their own rhythm and in-jokes. New Super-Man has been better the more its shown heart, and that comes through very well this time around. Though I'm unconvinced being a book full of antecedents is precisely the best use of New Super-Man, it seems to be a winning strategy for this title (make mine the Great Ten, but it's New Super-Man and the JLC who are headlining the book). To that end, Equilibrium starts to show its mettle with a faux-Bane and a scene colored similarly to "Knightfall"'s infamous back-breaking sequence, but with a different result. That continues to New Super-Man fighting his own Doomsday and then "dying" (complete with black recovery suit). These are applause lines, clearly, but they work, and also demonstrate where writer Gene Luen Yang sees Kong Kenan in his superheroic journey. Within that "death" sequence, Yang transports Kenan back to 1937, specifically within the confines of some of Action Comics's root "yellow peril" material. The audience sees this immediately for what it is, but Yang chooses to make Kenan complicit for a short time -- such, the villainous All-Yang says, to demonstrate the "illusion created to justify over a century of brutality." For all of New Super-Man's occasional silliness, writer Yang creates a markedly nuanced conflict here, in which All-Yang's desire for recompense for years of prejudice and violence is not wholly wrong, but Kenan must still fight against it -- fight against a certain view of justice for his own ancestors -- because of All-Yang's destructive methods. Equilibrium dilly-dallies at times, no less than when the Suicide Squad pops in for an issue mostly, it seems, just because Harley Quinn sells books. Similarly at times Yang has so much going on that I'm not sure he needed to put Lex Luthor in there too for a couple pages' repartee. The Justice League proper's cameo seems equally unnecessary, but it's so much fun -- Bat-Man meeting Batman, Wonder Woman already knowing the legend of the "Green Snake" Wonder-Woman, a weirdly jovial Aquaman like something out of the Brave and the Bold cartoon. Indeed there's not an antecedent for every Leaguer (and poor Cyborg apparently had to stay home this day), but how enjoyable this sequence is begins to demonstrate how much we've started to root for the Justice League of China characters. This was, of course, common trope material -- Kong Kenan was a jerk, his teammates hated him, and we were always headed to this place where Kenan would take the lead and his teammates would fall in line. But Yang has done well -- with the Bat-Man/Wonder-Woman relationship, as mentioned in earlier reviews, and with Super-Man and Bat-Man still calling each other "Dummy" and "Tubby" respectively, though now in grudging friendship. A lot can be forgiven if the audience likes the characters, and not unlike Rob Williams' recent Suicide Squad Vol. 6: The Secret History of Task Force X, Yang has been writing these characters for a while now and brought them far enough that they're starting to be able to carry the book on their own. As a bridge seemingly between what might have been this series' ending and its short second act, Mariko Tamaki contributes a single issue focused on reporter Laney Lan. Laney has not figured into this book as much as I'd originally expected, though she was one of my early favorite parts, reminding not so much of Lois Lane as Tana Moon to the irreverent Kong Kenan's Superboy "The Kid" Kon-El. I'm not sure, given that this issue was written by a guest writer, that this spotlight signifies Laney's return to the title, but it is a good slice of life -- slice of life of a reporter, slice of life of a daughter navigating family issues and the intersection of the Eastern and Western worlds. That Tamaki succeeds here is not surprising given her thoughtful Supergirl: Being Super; again, given that this book only has five more issues to go, I'm not optimistic Laney will get a lot more time, but Tamaki makes a strong case for letting the character show up somewhere else. I'm sure in the end the underlying slapstick of New Super-Man is what led to its cancellation, but New Super-Man Vol. 3: Equilibrium is as good a model as any for how a "removed" book like this can succeed. Yes, it is set in China, but in logical fashion we have the Suicide Squad, the Justice League, and Lex Luthor; this kind of apart-but-connected title is how DC should also do a Legion of Super-Heroes book or one set on an alternate Earth. Often I am not very excited digging in to New Super-Man -- true, I'll admit, this time too -- but when I finish I'm more eager to read the next one (and next time, the last one) than I thought I'd be.